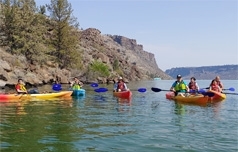 Lake Billy Chinook in Oregon's High Desert is a favorite destination for water sports. Join a guided tour during the spring and fall when the Lake Billy Chinook water is calmer than the summer months. On the tour, you'll learn about the local geology, area history and the plants and animals living near the shores of the lake. Single and double kayaks are available for $25 and $40. More information, dates and times, and registration details are available at the Park Store.